As you likely know by now, there are multiple ways to summon Siri on macOS; you can open Siri with a keyboard shortcut, you can access Siri from the menu bar icon, and you can open Siri from the Dock icon too. 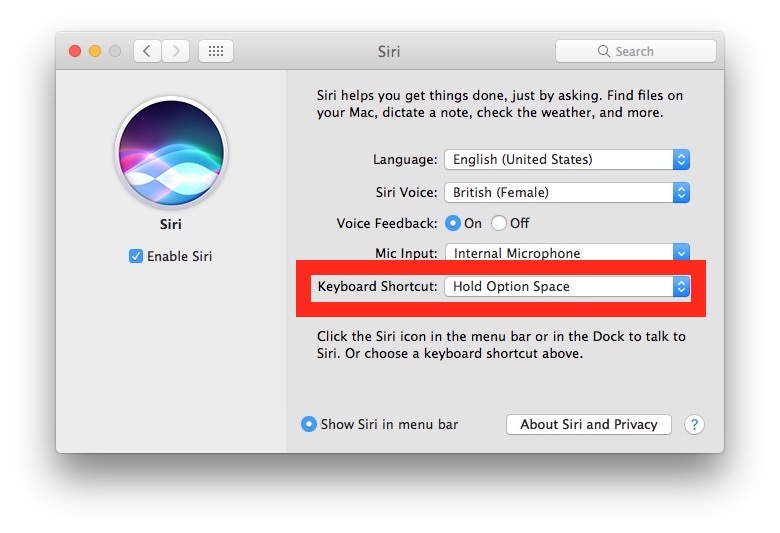 If you want to customize how you access Siri, you can change the keyboard shortcut to nearly anything of your choosing, allowing for a custom keystroke to open Siri on the Mac. Remember, all this is doing is adjusting what keystrokes are used to open Siri on the Mac, it has no impact on anything else and all the standard Mac Siri commands will work regardless of how you access the virtual assistant. What keyboard shortcut you use to open Siri on the Mac depends on your usage, but some users ay appreciate a simpler keystroke option, like a single function key that is otherwise unused. Personally I use Option + Space to summon Siri from the Mac rather than holding Command + Space, since Command+Space is also the keystroke for opening Spotlight, but many users like Control Space and other choices as well, it’s really up to how you use your Mac and keyboard. Opening Siri through a keystroke is particularly helpful for uses who choose to hide the Siri menu bar icon and Dock icon since it becomes the only way to access the assistant. However you access Siri on the Mac, don’t forget to browse through the list of Siri commands for Mac, there are many useful ways to interact with the assistant within macOS.